It’s a simple concept, but one that’s lost on most of our competitors. We got into this business because we were astounded by the bland, under ripe cherries available in our local stores right here in the middle of fruit country during peak season. We knew what a cherry should be like: sweet, flavorful, big and beautiful. So we set out to grow the best cherries Mother Nature could produce. Our high-elevation cherries are tree-ripened to perfection. They are the sweetest, best tasting and latest cherries available in the Northwest. By setting high standards and refusing to cut corners, we've been producing the region’s finest cherries since 1996. We have orcharding in our blood. We both were raised in Hood River, Oregon, and we have lived here ever since. My father [Katy’s] had a small orchard, and this is where I first tasted a perfectly ripened, hand picked cherry. I knew the potential of the Hood River Valley for growing the perfect cherry, so I set out to replicate -- and even improve upon -- the taste of cherries from my childhood. Today, the family tradition continues. All of the children are involved in the orchard, coming together every summer to pick and package cherries. They are as passionate about cherries as their grandparents. If we have it our way, our grandchildren will be working here one day as well. It makes us proud to see our whole family working hard to deliver the very best produce from Oregon’s Hood River Valley to families around the world. 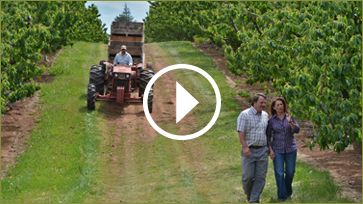 Hood River Cherry Company was founded by orchardists Kathryn Klein and Brad Fowler. They planted the first cherry tree in 1993, the day their youngest son was born. “My oh my what fabulous and huge, dark red cherries I purchased the other day from Whole Foods in Palo Alto, California, that came from your orchards. Every cherry is like a small golf ball and the taste ranges from 97.7 to 99.9 on every last bite. Never have I tasted more wonderful cherries, and I have had buckets full over the last 15 years or so once I discovered them. ©2013-19 Hood River Cherry Company. All rights reserved.